Every Father’s Day, the family and I usually take a weekend trip to the beach with our friends Stacy and Karen Croft. We decided to change things up a little bit this year with a trip to the lake house on Lake Broward for a little bass fishing and relaxing. 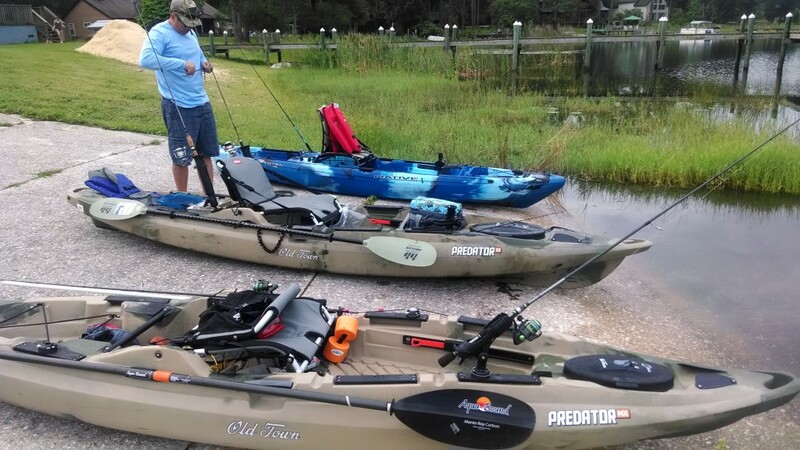 We packed up all the gear into our vehicles and made the trip down Friday afternoon after work so the guys and I could get up and on the water in time for the early morning bite. To say I was excited about some Father’s Day bassin is an understatement. The next morning we were all up at first light with one thing on our minds, the chance of catching one of those lunker bass that I kept hearing about from our cousin, Rhett Buford. By the time I got outside, my son Austin and Stacy already had the kayaks down at the launch and ready to push off. Of course, this was fine with me. The less work I had to do the better, after all it was Father’s Day weekend and I was there to relax as it should be. Yaks ready to launch and catch some bass. We got the yaks in the water and paddled our way around to the first cove, which was just a short paddle from the launch. A couple of weekends before, my son and I had caught a few bass there. We arrived at the small cove, and it wasn’t long before I had my first bass on the line. 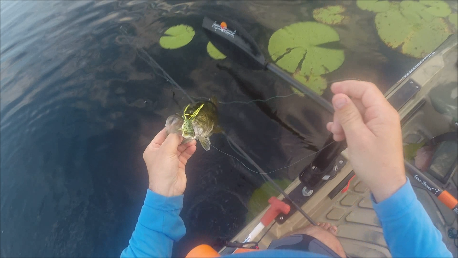 He had hit the Live Target frog I was casting into the lily pads as soon as it hit the water. I had picked up some artificial worms to try made by Berkley, and I figured that the Gulp lures worked great in the saltwater for the trout and the redfish, so it couldn’t hurt to give them a try in the freshwater. 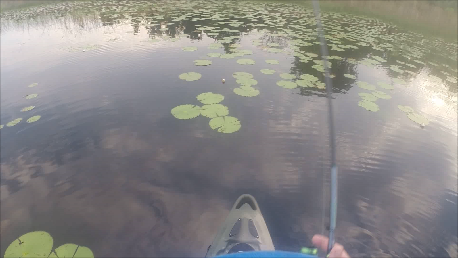 So I rigged one up weedless and started casting up into the pads working it the same way I had been working the frog; pulling it across the pads and letting it free fall into the openings in the lily pads. It wasn’t long before I had my second bass on the line which I quickly brought to the boat and released. Needless to say old dad was putting a whooping on the youngster, and it’s not very often that I can say that. I was feeling pretty confident at this point with the way things were going. Then I started hearing Stacy and my son, who were working the opposite bank, say that they had just landed a pair of nice bass themselves. Working the lily pads for bass. I started to make my way back to the front of the entrance fishing the bank that Austin and Stacy had fished on the way in. I picked up a few more smaller bass around the docks. This made the total for me so far 4 bass. Austin and Stacy each had a bass each themselves, not too bad for a morning of fishing. About that time of the bite getting really good, my wife texted me saying that breakfast was waiting on the stove. I yelled to the guys that I was heading to the house for some breakfast. Austin said he was coming in with me, but Stacy wanted to keep fishing. I told him that he should try the cove across the lake, as I had landed a few quality fish a few trips ago. Stacy headed off in that direction while Austin and myself headed to the house for breakfast. I hadn’t been inside long enough to finish my breakfast when Austin came running in to tell me I needed to come check out the bass that Stacey had brought back to the house. I stuffed the last few pieces of bacon in my mouth and headed down to the boat ramp where Stacy was smiling from ear to ear. When I saw what he had on the stringer I understood why. 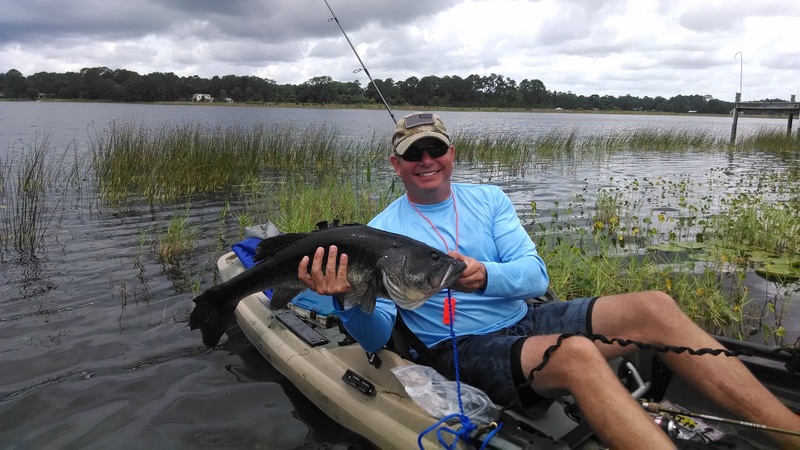 It was 24 inch, 8 1/2lb bass that was as black as midnight. We took a few pictures, and we released the big girl to grow some more and produce more little ones. We ended the day with some steaks on the grill to cap off a good weekend before the Crofts had to leave for home. All in all it was another great Father’s Day. I enjoyed spending time with my family and friends, sharing my passion of kayak fishing with the ones I love most in the world. I’m already looking forward to the next opportunity to chase more of those bucketmouth bass down at Lake Broward.